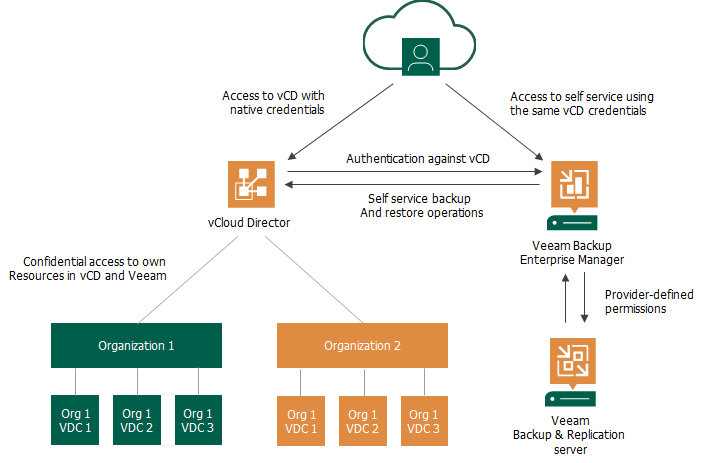 Veeam Backup & Replication supports VMware vCloud Director, allowing users to back up and restore single VMs, vApps, Organization vDC and whole Organizations. Starting with v9.5, service providers have an ability to allow self-service restore operations to their customers via friendly and convenient web UI based on Veeam Backup Enterprise Manager. Administrators on service providers side are granted administrative rights for Enterprise Manager. Thus, they have access to Configuration view in its web UI where they can configure vCloud Director organization settings (on the vCloud tab), including repository quota and backup job template. As a rule, these administrators also have access to Veeam Backup & Replication management console, controlling vCloud Director as part of backup infrastructure on the provider side. Users on the tenant side do not need administrative rights for Enterprise Manager - instead, they get access to self-service web portal. There they can manage their vCloud Director jobs, as well as restore VMs, files and application items within their scope. As a rule, these users are vCloud Director administrators in charge of data protection in their vCloud Director Organizations. The VMware vCloud Director machines must meet system requirements. For more information, see System Requirements. Consider that if you have a vCloud Director server included in the backup infrastructure with version earlier than 9.5, that server will not be supported. In v9.5, Veeam leverages the native vCloud Director authentication technology to authorize users to log in to Enterprise Manager. The authentication process and components interactions are shown in the figure below. This approach helps to streamline administration and management tasks on provider side, as now a tenant only needs to be configured once in vCloud Director, and then any change like a new password or a 'Disable' operation will be immediately reflected in Veeam Enterprise Manager. What Administrators on the Provider Side Can Do? Configure settings for the tenants (vCloud Director Organizations), including backup job templates to be used, backup destination and repository quota. Apply restrictions to particular tenant users' ability to schedule the jobs, for example, preventing the jobs from running too often. Administrators can even completely prohibit the tenant's ability to schedule jobs, instead setting the required schedule themselves (manually or using a script). Together with Veeam's built-in load balancing, these capabilities allow administrators to ensure infrastructure is protected from excessive resource consumption. What Users on the Tenant Side (vCloud Director Organization Administrators) Can Do? Create new backup jobs for the objects in their scope, based on the pre-defined templates. Tenant users are allowed to configure essential job settings (such as VMs to backup, retention, schedule, notifications, and guest OS processing options). Modify or delete the jobs. Enable or disable the jobs. Start, stop, retry the jobs. View statistics on vCloud Director backups. Restore vCloud Director VMs to the original vApps and vApps to the original vDC. Perform application item restore for SQL Server and Oracle databases. Restore files from indexed and non-indexed VMs guest file system. To simplify job management for the tenant-side users, advanced job parameters (like backup mode and repository settings) are automatically populated from the job templates. These templates are assigned by administrator on service provider side to the particular tenant.